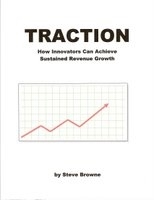 My name is Steve Browne and I wrote the book TRACTION to help early stage entrepreneurs get the whole "sales thing" right. I have 30 years experience in B2B sales at startups (and larger organizations). I've developed a methodology which combines targeted marketing and value-based selling to allow startups to achieve sustained revenue growth. I've also created a blog to supplement the material in the book. None of the downloads below require you to pay or sign in or anything like that. Download the book TRACTION (in PDF format) without having to pay or even sign in. Visit my blog at www.innovatorstraction.wordpress.com for answers to common questions I've gotten as feedback from other entrepreneurs who have read the book and implemented the methodology. Download the worksheets I've provided to use in conjunction with the ten steps in the typical sales cycle described in the methodology in the book. For those doing this for the first time, the worksheets provide a handy guide to to which questions need to be answered in order to determine exactly how likely a particular deal is to close (how far along in the ten steps it is).